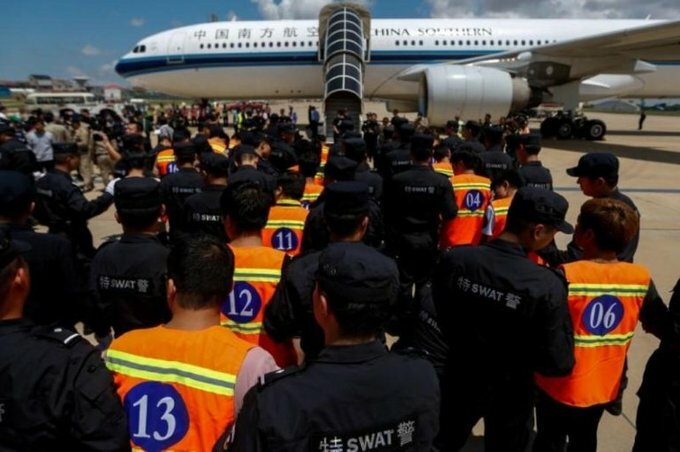 Cambodia, a staunch ally of China, has previously deported suspected scammers to China, even those holding Taiwan passports. Cambodian police on Monday arrested 100 Chinese people suspected of running a telecoms scam to defraud victims in China, a senior official said. China has been battling telecoms fraud for years, with the losses to victims running into billions of dollars, authorities in Beijing say. Hundreds of suspected scammers were arrested in Cambodia last year. Monday's arrests at a seven-story condominium in the capital of Phnom Penh included 81 Chinese men and 19 women, said General Uk Haiseila, chief of the Immigration Investigation Bureau. Police video of the raid showed the suspects seated in front of laptops on rows of desks in a room with curtains drawn. Cambodia, a staunch ally of China, has previously deported suspected scammers to China, even those holding Taiwan passports. Cambodia, like Beijing, does not recognize Taiwan as an independent nation. Uk Haiseila did not say which countries' passports the arrested individuals held, or if there were immediate plans to deport them.